Modern Web applications need to have a way to inform the user about the result of their actions. For example if someone press the “Save” button, he or she should be notified with a message like “Document saved” or error message “Cannot save the document”. In addition some of the notifications are not too important and should be shown for a while and disappear automatically after few seconds. It supports 4 types of messages: Info, Success, Warning and Error messages. Ideally, the ErrorSuccessNotifier should be inserted in the master page (Site.master) of the ASP.NET Web Forms application and will display error and notification messages in all pages of the application (when such messages are assigned during the event handling C# logic). Download the full C# source code of the ErrorSuccessNotifier Web user control: Error-Handler-Control-ASP.NET-by-Svetlin-Nakov.zip. This will check if *any* version of jQuery is used and inject 1.6.1 if jQuery is not found. I agree, this is a better approach. Thank you for the suggestion. In my page i have a textbox with a requiredfieldvalidator associated. 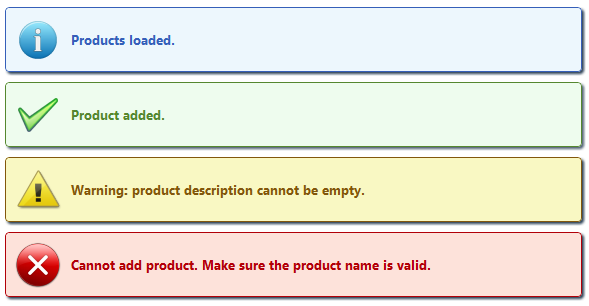 How can i use your control to notify also the error message from the validator? Great control! How can I use this with AJAX? It is not designed for AJAX and might need to be changed a bit to use it inside an UpdatePanel. gett information concerning my presentation topic, which i am going to deliver in college. I love what you gguys are up too. Such clever work and exposure! Keep up the goodd works guys I’ve added you guys to our blogroll. Hi to everry body, it’s my first go to see of this weblog; this weblog includes awesome and really good data in favor of visitors. I’ve just bookmarked this page, brilliant blog! What could you recommend about your submit that you simply made a few days ago? Thanks a lot! I hope this can be useful to somebody!